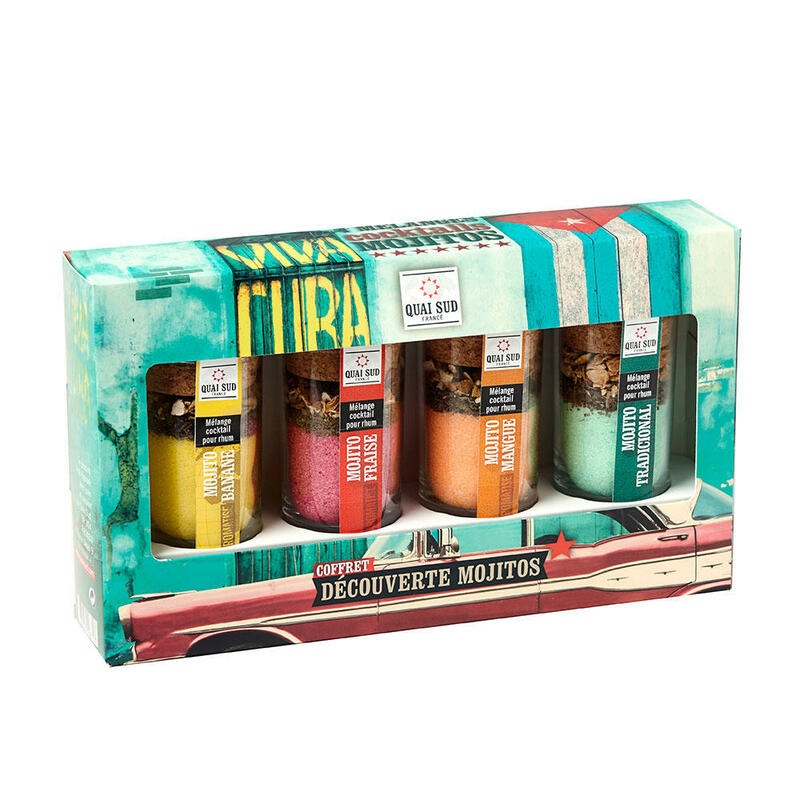 Our four best selling mojito cocktail mixes in miniatures. All the flavours you need to make these fruity foursome, just add alcohol. Each cocktail mix will make up to 6 cocktails. Pour the cocktail mix into a jug. Add 25cl of rum. Leave to infuse for 1-2 hours. Sieve out any left over pieces of dried fruit and herbs and then add a mixer (soda or lemonade). It couldn't be easier to make these fabulous cocktails. Traditional mojito mix (lemon-mint) : cane sugar, 10.5% lemon peel, 3.9% mint leaves, natural lime flavour, acidifier: citric acid, colouring: E104, E133, natural mint flavour 0.2%. May have a detrimental effect on children's activity and attention. Strawberry flavoured mojito mix : cane sugar, lemon peel, strawberries 3.9%, mint, strawberry powder 0.9%, natural taste strawberry flavour 0.2%, carmine natural colour, acidifier: citric acid, natural flavour lime taste), aroma natural mint). Banana flavoured mojito mix : cane sugar, lemon peel, mint, 2.6% banana (banana, coconut oil, sugar, aroma), natural banana flavour 0.4% and lime taste), acidifier: acid citric, colouring: E102, natural mint flavor. May have a detrimental effect on children's activity and attention. Mango flavoured mojito mix : cane sugar, mango pieces (mango, sugar, citric acid, E220 (sulphite)) 7.5%, lemon peel, mint leaves, lime flavour natural flavour, mango aroma 0 , 2%, acidifier: citric acid, natural mint flavour, yellow sun dye E110. May have a detrimental effect on children's activity and attention.